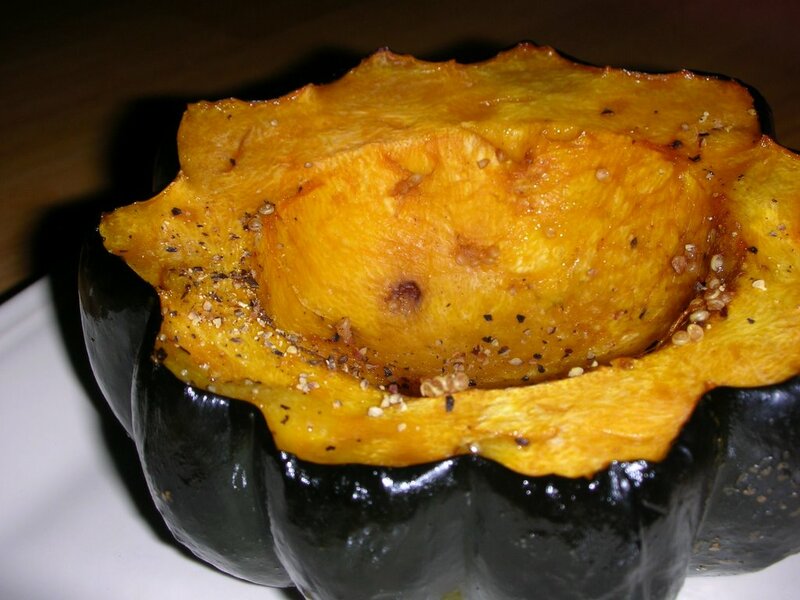 Just simple acorn squash, adorned with nothing more than salt and pepper, then roasted. And ohhhhh so good in a homespun kind of way. Only the knife work is tricky. Tonight I tried the microwave trick to soften the flesh a bit before slicing open the squash. Maybe more than 2 minutes is needed? It didn't seem to make a difference. Cooking squash cut-side down (only if no butter or brown sugar is involved, of course) seems to cook the flesh more evenly and creates crispy caramelized edges -- to check for sure, I'll try a side-by-side comparison some time soon. Wash the squashes, then slice in half cross-ways. Scoop out the seeds and membrane gunk and discard (or wash/roast/saute the seeds). Rub the skin with olive oil. Sprinkle the flesh with salt and pepper and place cut-side down on a baking sheet. Place in the oven for 60 minutes plus whatever preheating time remains.